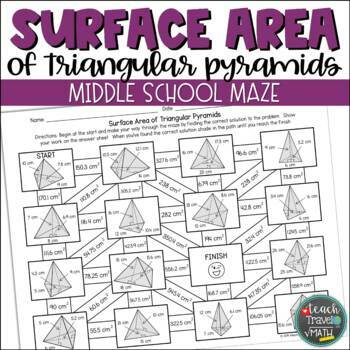 No prep worksheet helps students practice their understanding with finding the surface area of triangular pyramids in a fun maze game. The maze includes 16 boxes, however, not all questions will be answered. Students will work through the solutions on the provided answer sheet, their solution will guide them as they make their way through the maze from start to finish. Students can use their pencil to shade in the maze or a highlighter, marker, colored pencil, or crayon. There is only one solution to the maze. I’ve included an answer key to the maze and the answer sheet that shows step-by-step solutions. 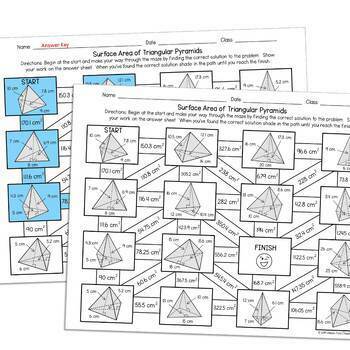 Great for classwork, homework, test review, sub. work, partner activity, or for early finishers! Follow My Store. Don’t miss out on new products, sales, and freebies! Don’t forget to leave feedback to earn TpT credits for future purchases! Every 20 credits is worth $1! Please take a moment to give a star rating and comment. If you have any issues with your purchase, please contact me before leaving a negative review. I will do my best to resolve the issue.